Rumors were floating around a month or so ago... We can now report that that Lyle Shelton's Rare Bear will go to a new owner for future racing efforts! Good news is the new owner wants to race and wants to win! Pilot and crew information are not available at this time. The message below was just posted at the rarebear.com website. We are pleased to be able to tell you today that the Rare Bear is going to a new owner. This is, indeed, good news for the airplane and the sport of air racing. We have been blessed with the most loyal fans that any race team could ask for! Those of you who have supported our racing efforts with your memberships in the Rare Bear Fan Sponsor Club over the last few years have made the success of this race team possible. As all of you know, preparing an airplane like the Rare Bear for racing and keeping it healthy and competitive is a difficult and very expensive process. The cost of parts and supplies for the racer have risen to a level that has simply made it impossible for us to continue. Rod Lewis and Lyle Shelton have finalized an agreement in which Rod will take ownership of the airplane and the race team. Rod wants to race and he wants to win! 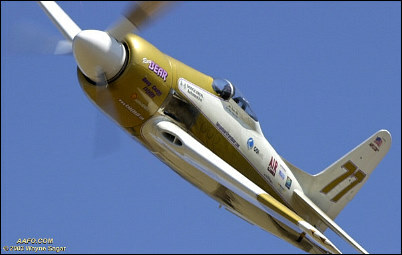 Rod Lewis and The Rare Bear Air Race Team will bring the airplane to the next level of competition. Rod Lewis will continue to honor the great legacy Lyle has built throughout these years. We've said it before, without your help, we could not have done it! Our appreciation for the loyal support of the Fan Sponsors will continue, though we must dissolve the official "Fan Sponsor Club" at this time. The legacy of your support will always be with the airplane, wear your Fan Sponsor jackets proudly! You made it happen! From all of us on the Rare Bear Air Race Team, THANK YOU!